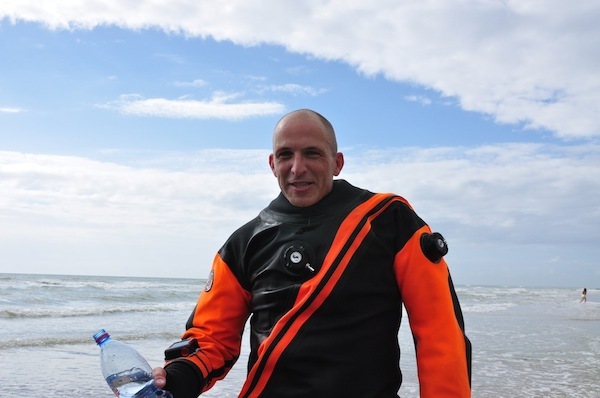 Calais/Munich, June 29, 2012 – At 04.50 am local time in the UK this morning, Achim Schloeffel started the world record in diving from Dover at the British coast. He reached the French coast around 02.00 pm and came back to the surface after spending another 160 minutes in decompression. Eight hours darkness and cold water and a distance of around 55 kilometers through waters with strong currents and one of the busiest ship lines in the world have been the challenge Achim Schloeffel mastered. A complex interaction of state-of-the art dive equipment, a logistical masterpiece of the project team regarding the planning of currents, navigation and nautics and last but not least courage and stamina of the professional diver have led the ambitious project to its successful completion.